Liverpool’s signing of goalkeeper Alisson from Roma could lead to Arsenal losing Petr Cech in a transfer to the Italian giants, according to reports. The Gunners, of course, have made a new addition of their own in goal this summer, bringing in Bernd Leno from Bayer Leverkusen. 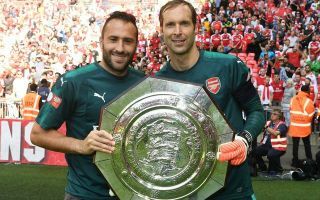 The north London giants also have David Ospina as another potential backup option, so losing Cech to Roma might not be the biggest tragedy. This link comes from a report in the Sun, who claim that Roma director of football Monchi believes an experienced ‘keeper like Cech could be ideal for his side’s defence. Cech has not looked at his best for Arsenal for some time now, so it’s little wonder Leno was brought in to strengthen in that department. As noted by the Sun, Chelsea have also been linked with a surprise move to re-sign the Czech Republic ace from Arsenal as they face losing Thibaut Courtois to Real Madrid. Gianluca Di Marzio also linked the Blues with Alisson before he joined Liverpool, so Cech could have been a decent alternative for them between the sticks.